A century old 'legacy' serpents through the sequestered hills of the Kanchenjunga carpeted with forests and tea plantations, hewn in a multi-colored avian and floral metropolis and equally vibrant clusters of tribal villages with giggling Bhutia and Lepcha women. The 'legacy' is affectionately named the 'toy train'. What makes the sojourn so singularly rapturous, besides the panoramic backdrop, is the trail through a treacherous 88 km of undulating and steep gradient on a two foot narrow gauge that celebrated its 125th birthday this July. 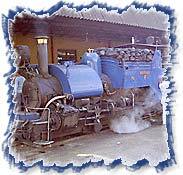 Leaving the hung-ho aside, welcome to the Darjeeling Himalayan Railway, a World Heritage and a prized remnant of the British Raj - that ferries between Siliguri and Darjeeling. A brainchild of the Eastern Bengal Railway agent, Franklin Prestage, the engineering marvel moves on adhesion and chugs its way up to Ghoom - Asia's highest railway station at 7,407 ft.
What is peculiar about the railway is that everytime the gradient is too steep, the tracks are brought back a few yards and the climb begins at a slightly different point, sketching a z-shaped zigzag-not once, but six times in the 51-mile-stretch from Siliguri to Darjeeling. The 8-hour voyage from New Jalpaiguri begins at about 9 AM every morning. Forests melt into endless expanse of manicured tea-plantations that look like giant steps on the hill, as you reach the first station Sunk (146.5 mt). The first spiral loop begins as the train painstakingly puffs through an almost impenetrable thicket of Sal, Toon, Teak hewn with purple bougainvillea, the scarlet poinsettia and the exotic mauve orchids that cloister a world of breathtaking beauty of roaring waterfalls and gurgling streams. At about the 22nd km, is another complicated loop. The travellers then experience their first reversing zigzag as the train whistles through its next loop at Chunbati (2,000ft) scaling greater heights to reach the station at Tindharia (2821 ft). Soon the train heads for another reverse, the last one at 3,400 ft just after Gayabari Station where the line runs close to the edge of a precipice with the Pagla Jhora or "Mad Torrent", a thundering waterfall in the distance which in its fury washes away road and track, houses and shops every few years cutting off Darjeeling for days during the monsoons. The next one, Mahanandi Station at about 48 km, gives one a glimpse of the source of the river. Another kilometer or so, and the Kurseong Station (4,860 ft), or "The Land of the White Orchid" emerges, as the train whistles through the streets and shops with little children screaming in excitement. The train heads for the Toong Station (5,565 ft) with the mighty Kanchengunga in the backdrop, hypnotizing the beholders and the thought of chasing such heights in a Tom Thumb Carriage, tingling their nervous system. Piercing through dense fog, the train reaches Sonada Station (6,552 ft) - known for its wild bears, bounty of fruits, vegetables, milk and Darjeeling tea gardens. From here the train snakes along twisted paths along the Senchal Lake, Tiger Hill, Kalimpong and the many tea gardens to alight at the Indo-Nepal Border - Ghoom (7,407 ft) - enveloped eternally in a mist and dotted with a legion of colorful monasteries. From here the train starts descending towards Darjeeling to reach the most spectacular engineering feat on the line - the double loop at Batasia, aptly named the "Agony Point" after the churning it does to one's stomach - with the breathtaking snow-white peaks of Kanchenjunga as a backdrop. At Batasia, there is a memorial to the Gorkhas. After a painstaking trail, the train takes its last drink of water before teetering precariously on the hillside to reach its final destination, the Darjeeling Station. 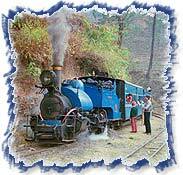 Right from big-wigs in the literary world (Mark Twain called the journey his most enjoyable day on earth) and nature enthusiasts to the Bollywood - the toy train so synonymous with Darjeeling - continues to mystify its guests with a journey one of its kind. Looking for more details ? Click here.